My body is not in a good condition since Tuesday. It’s make me sad because I couldn’t do a lot of things. I was absent from Clinic yesterday, my bedroom is totally messy, I’m barely touch my blog and neglecting a lot of comments, all I can do just sleep all day. Hiks.. Now I try to push my self to wake up and make an English Friday post. Huha! Psssst. I use Kool Fever for Baby right now and it’s work to reduce my fever. I’m forget why i bought this stuff, but since it useful I think I want to restock this stuff. Hihihi..
Today’s English Friday challenge is..
For only one chance, what kind of tool you will grab from Doraemon’s magic pocket? I want a magic glove. I don’t know Doraemon has it or not, but since this challenge allowed us to make an innovation so I choose to make one. Magic glove is my imagination since a long long time ago. I was a magazine addict back then, and every time I look at good stuff like bags, clothes, shoes, gadgets, etc I want to have it all. I wish I have a magic glove, if I wear it and touch a picture of things that I want, that stuff becomes real. You want a magic glove too? dan akhirnya semua toko online shop tutup. Karena takut disentuh sama kamu Nit. hahahaha. hahaa.. kan yang punya cuma aku aja Mas, dan aku orangnya cukup wise kok kan ngobrolnya sama Mas Ryan dan Mas Andik.. hahaha..
Hahahahaha. Jadi kalau ada yang merugi online shopnya karena kamu dong. wkwkwkwk. 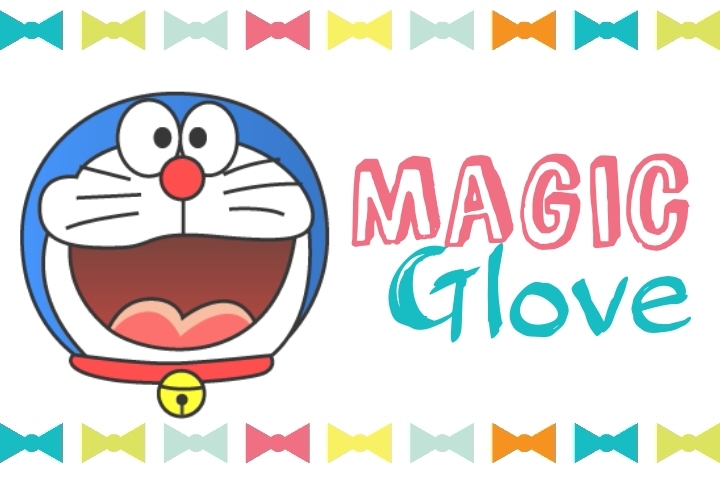 Hahaa.. aku malah gak kebayang jadi kaya gara2 magic glove ini.. emang klo otaknya udah bisnis beda ya Mak.. Ya, bukan Yang. Btw cepet sembuh ya. Wish you a speedy recovery Nit! Thank you Mas.. udah enakan trus dipake begadang.. hahahaa..
Nice and concise post Nit. Very effective! Magic glove is a great idea, didn’t even think of that until I read your post. Wishing you a speedy recovery!! Drink lots of fluid and load up on your vit C.
Gpp kok Mba. Cuma inget pas wa-an malam2 itu and Nita send the screen captured. hahaha. Buahahahahahahahaha…..nakal ya Ryan. Kasian tuh masih recovering. touch and it shall be real? wow. Thank you.. aku jadi terhura! yeay! Sctv udah disensor ttp kelihatan… Hahaha..
Bukan.. Dia klo nggak slh mirip tangan gitu atau lem ya. Lupa.